Join Cannabis Forward as we host Greenville's first hemp festival. 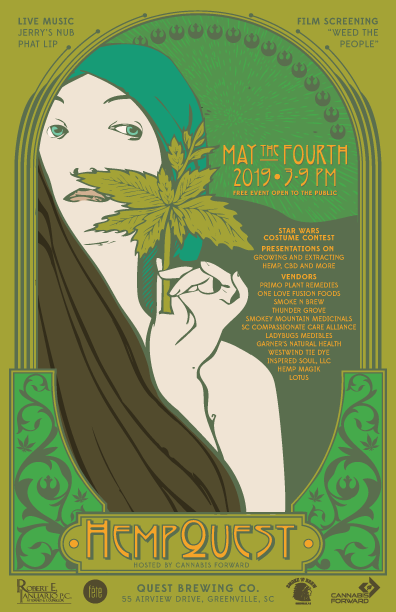 HempQuest will take place on May the Fourth at Quest Brewing Company from 3pm until 9pm. The event is free, but a suggested love donation of $10 can be taken in gratitude at the gate. Be sure to wear your best Star Wars costume! Enjoy a screening of the film "Weed the People", learn how to grow hemp in a greenhouse, discover the benefits of CBD, listen to live music, browse our vendors, and eat some delicious BBQ. For more information, please visit our​ Facebook page.